Matisse as Printmaker ends August 22! The summer has gone so quickly! Last spring I remember waiting with bated breath for the Matisse as Printmaker to come to Austin at The Blanton Museum. It runs through August 22, 2010 so there is only less than two weeks left. As a student at The School of The Art Institute of Chicago, one of the requirements in the Intro to 2D class is to go to the Print and Drawings Collection in the museum and choose a piece to copy. 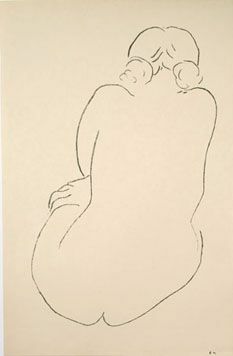 I chose a Matisse print very similar to this current’s exhibition press image. I was mesmerized by all the information Matisse gives with so few lines. Quite incredible. This exhibit is comprised of 63 prints by Henri Matisse drawn entirely from Pierre (his younger son) and Tana Matisse’s foundation. The dates of the work range from 1900 to 1951 so you can really see how his style evolved. I had a lovely afternoon with a dear friend I have known since 7th grade in Lexington KY. She now lives in Moscow and brought her high school aged sons to the US to check out UT and other colleges of course. Have to say they fell in love with Austin immediately and my friend's maiden name is Blanton (no relation to the museum) so the visit was a definite must. Enjoy!